Something like a movie is capable of two things. It can either reflect on and attempt to grasp the truth of things in a deeper sense (things like humanity, courage, love; the big stuff), or it can reflect on the state of things as we find them – truth in a limited sense. The first Terminator did the first, with some of the second thrown in. The struggle against relentless forces and man’s potential destruction by the work of his own hands, while perhaps not timeless themes, are at least themes that encompass all of time; Ditzy 80’s chicks, insecure waitresses, and killer robots have more to do with current issues. get him to volunteer at the home for boys! slaughtering us all will simply no longer compute! When a movie reflects on the broader kind of truth, it has the opportunity to point out to us what we should be striving for. Pointing toward the kind of ideals that might help us shape the actual world, and giving us an uplifting glimpse of what’s good. When a movie does the second, it is often presenting us with problems we have, without solutions we need. Sometimes this is really annoying, but it is also potentially helpful. Seeing a situation, presented metaphorically, may help someone who does know what to do see the problem clearly enough to see the answer. But it doesn’t then say: “help! Figure this out or we’re screwed!” It seems to think we’re doin’ fine. All we need to do is embrace the very thing that is trying to destroy us. But on a metaphorical level this is wishful thinking that has stepped over the line into delusion. This says: “Maybe the technology will stop itself, and then teach us to stop”. I am not necessarily agreeing with this movie’s assessment of the situation of mankind. I’m merely pointing out the comment it seems to be making. And, the fact that it doesn’t even know that it’s making it, or that there is a problem, is what makes this truly a bad sequel, in that it is what makes it a deficient work of art. Even when a movie fails in this way, it is possible to get some good out of it. But the movie itself isn’t helping. We have to do all the lifting ourselves, because the spirit the movie represents is one of the things we must find a way to combat. And part of that fight is calling it a bad movie. Sorry. 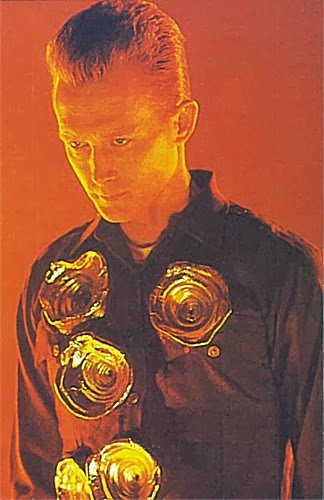 But, hey, the T-1000 was cool.